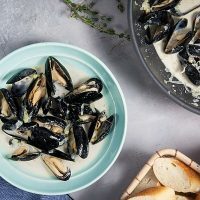 Creamy Apple Cider Mussels | Healthy. Delicious. Mussels seem elegant, but they’re so easy to cook at home. This version is served with leeks and a delicious creamy apple cider broth. 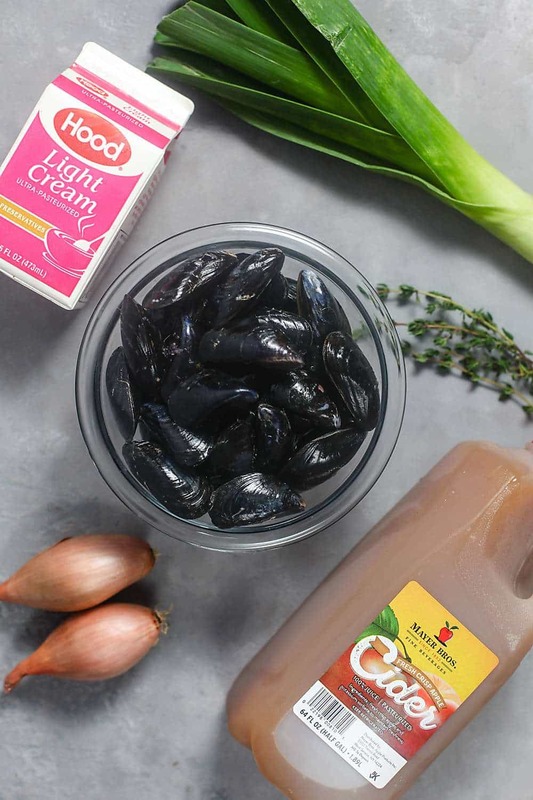 Apple cider and cream is one of my favorite fall flavors and, together, they make a delicious broth for these mussels. The sweet, briny flavor will make you feel like you’ve travelled to Northern France or the Canadian coast. Make sure you have plenty of crusty bread or oven fries on hand for dunking into the sauce! If you’re as obsessed with the cider + cream combo as I am, be sure to check out my Creamy Apple Cider Slush and Pork Chops with Cider Pan Sauce, too! 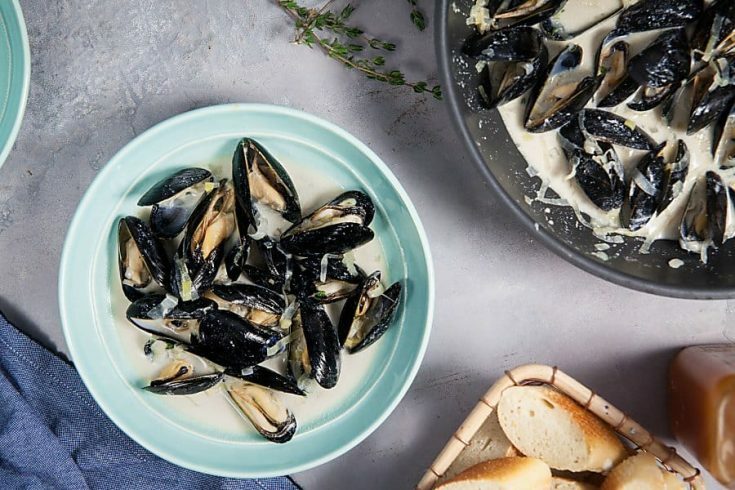 A lot of people are intimidated by cooking mussels at home, but it’s really easy – I promise! 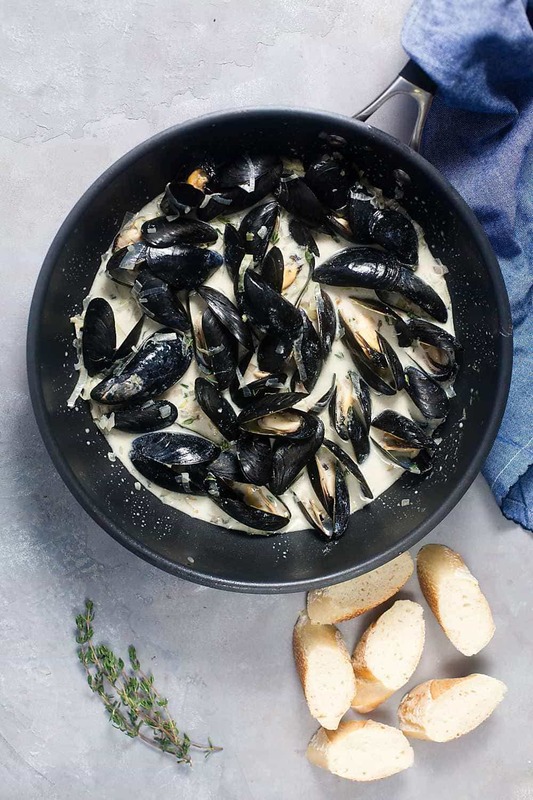 First things first, you want to start with mussels that are as fresh as possible. I always buy them from a reputable seafood market the same day I plan to eat them, and I recommend that you do the same. When you get the mussels home, give them a good scrub to make sure they’re clean. If the mussels have a beard (it looks like string or seaweed stuck between the shells) you’ll want to scrub that away too. While you wash them, look for any shells that are open. Give them a solid tap – if they snap closed, you’re good to go; if they stay open, throw them away. Here’s a video so you can see just how easy they are to make! 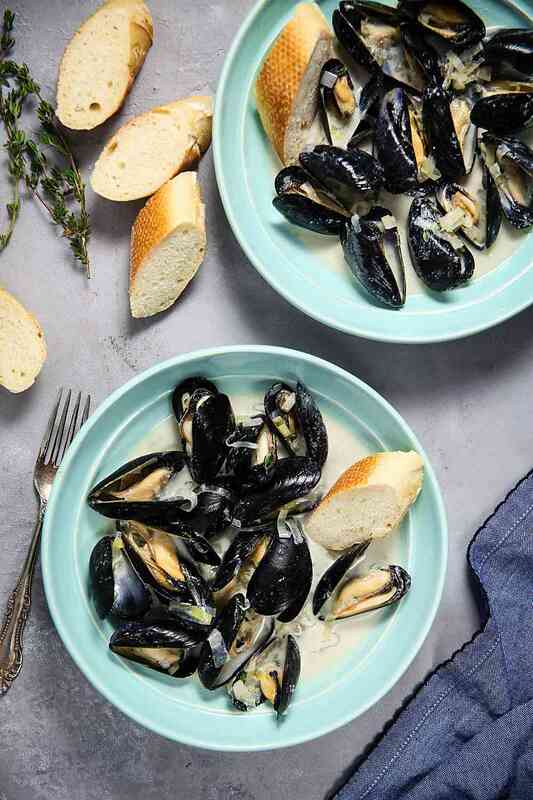 My favorite way to cook mussels is to steam them in a flavorful broth or sauce, so you’ll want to start that next. For this recipe, I sautéed some shallots and leeks, then cooked them in wine and apple cider until they were soft. Bring the broth to a simmer then carefully add the mussels, making sure you don’t break the shells. Cover the pan and let the mussels steam for 5-7 minutes, or until the shells pop open. That means they’re cooked and ready to eat! Spray a large, deep pan with cooking spray and set it over medium heat. Add the shallot and cook, stirring frequently, for 1-2 minutes, or until it begins to soften. Add the leeks and cook another 1-2 minutes. Stir in the wine; cook until nearly evaporated. Pour in the cider and bring to a rapid simmer. Carefully add the mussels to the pan. Cover and cook 5-7 minutes, or until the shells open. Remove the pan from the heat. Stir in the cream and thyme. Season to taste with salt and pepper.